We kicked off the meeting with the mug rug swap. Brooke, Sister Ann, Ruth, Robin, and Christy each created fun and bright pieces to swap. 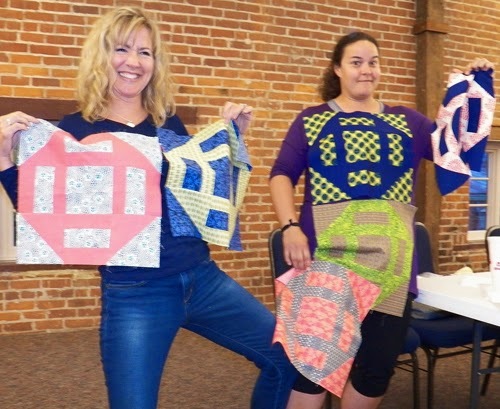 Brooke, Sister Ann, Ruth, and Robin each holding the mug rugs she made. 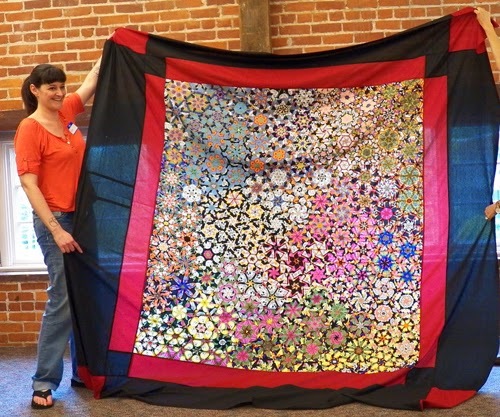 Modern Quilt Guild Showcase at International Quilt Festival: Entries for the modern quilt showcase at the Houston Quilt Festival will be accepted until July 27. Click here for more information. 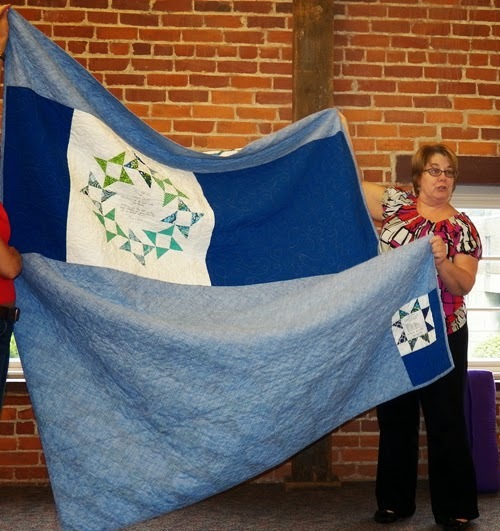 QuiltCon: Quilt Show: Entries for the quilt show at QuiltCon will be accepted starting July 1, 2014. 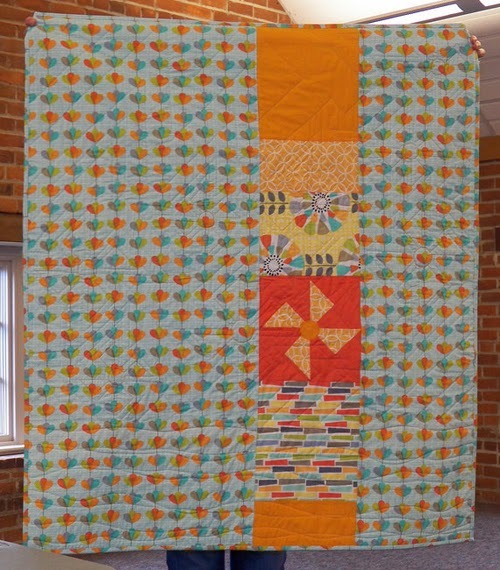 There will be cash prizes for first, second, and third place, or you can submit your quilt for "exhibit only." 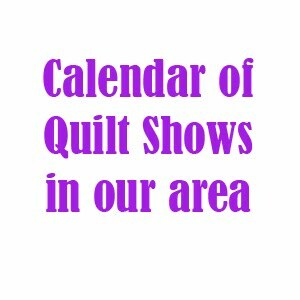 Click here for more on the QuiltCon quilt show. 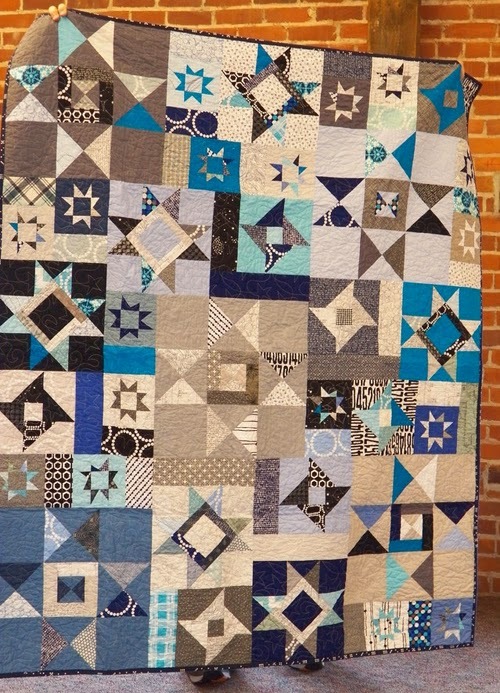 Giveaway Quilt Challenge: Create an original quilt pattern sketch and enter it into this contest. The winning design will be made into a pattern to be sold to benefit MQG, and the winner will receive a prize of $500. Click here for details. Michael Miller Challenge: The deadline for this challenge has been extended to July 25! 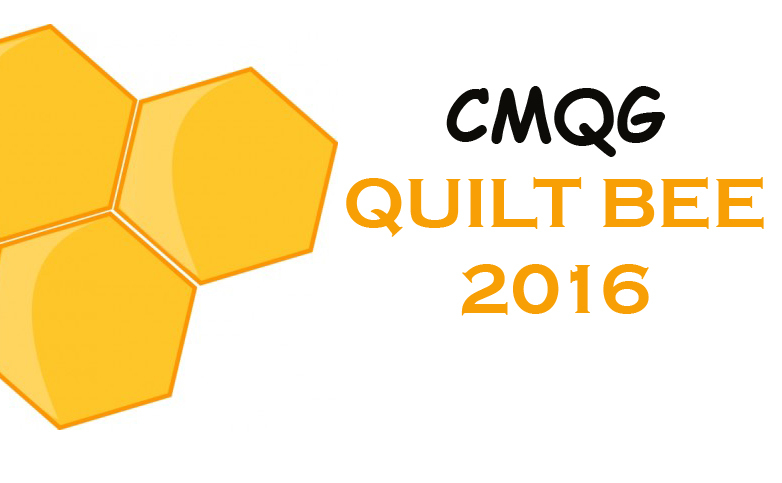 Make your quilted item using the fabrics we received and upload an image of the item to the MQG site by that date. 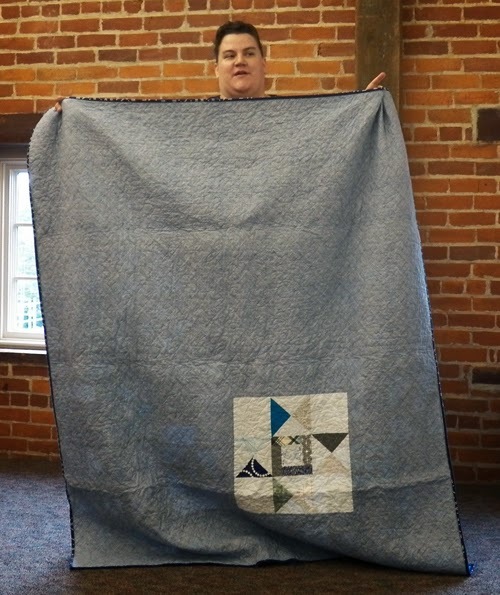 Remember, the Cincinnati Guild is encouraging you to make a quilt to donate to Project Linus (the minimum size for these quilts is 36" square). 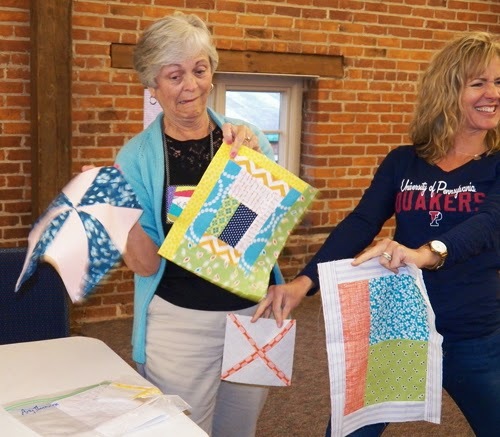 Pat Sloan Lecture and Workshops: The Ohio Valley Quilt Guild is hosting Pat Sloan, quilter and radio personality, on August 3 and 4. Click here for more information on the all-day workshops. Cincinnati Quilt and Fiber Artists: This group is having a gallery show through the end of June at Gallery Veronique at Harpers Point. Carole from our guild has pieces in the show. 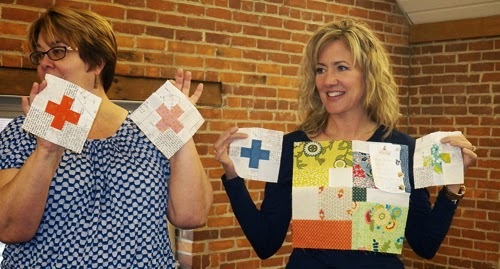 #OHCraft Sew-In: Guild member Kara Sanders is organizing a sew-in at Shawnee State Park the first weekend in October. Click here to go to Kara's blog for details. 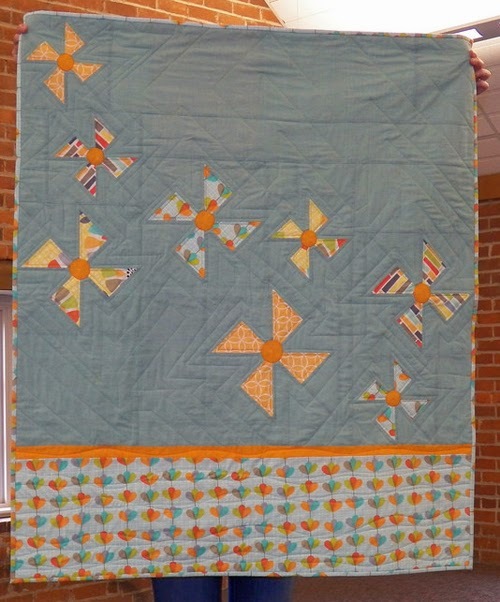 Brooke's Star Fall Quilt (pattern from Fresh Lemons). The back of Brooke's quilt. 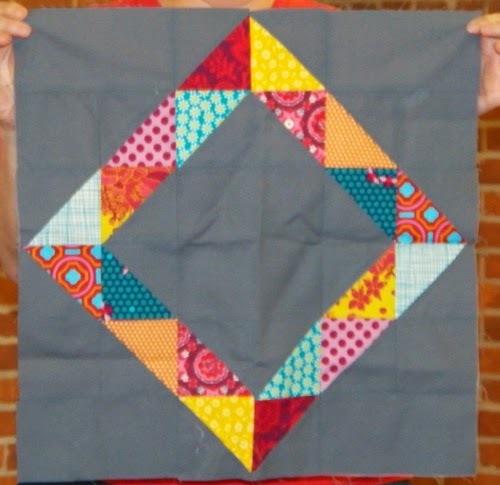 This block didn't turn out the right size for the pattern, so it became a design element on the back. Ta da! 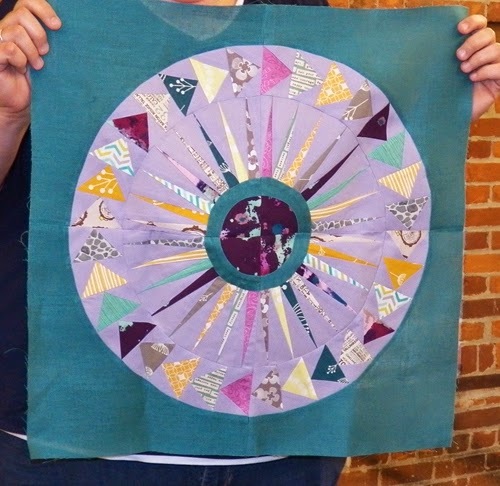 Christine's Michael Miller Fabric Challenge entry. 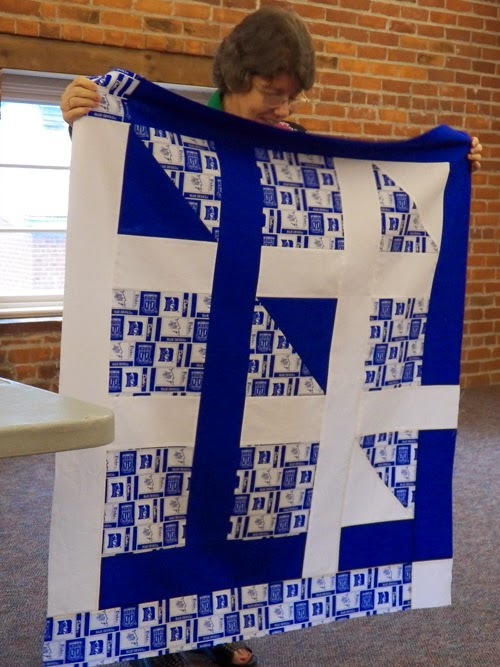 She'll be donating the quilt to Project Linus. The back of Christine's quilt where she used most of the leftover challenge fabric. 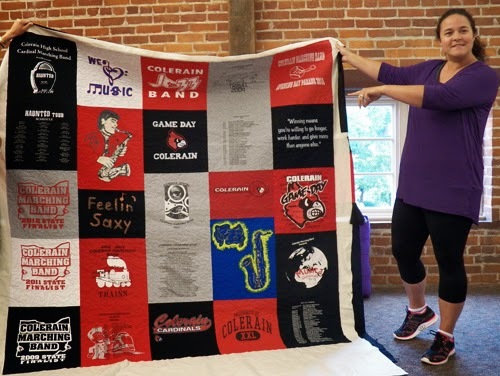 A signature quilt Ellen made for her boss as a retirement gift. Employees from all over the country signed blocks. The back of Ellen's signature quilt. 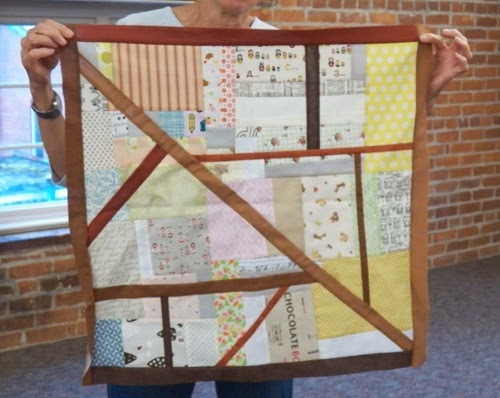 This is also the first quilt Ellen quilted on her new long-arm! 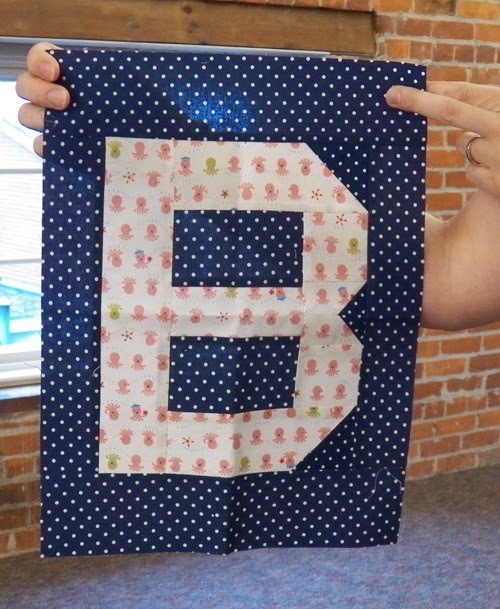 Christy made this, her first T-shirt quilt, for her nephew. 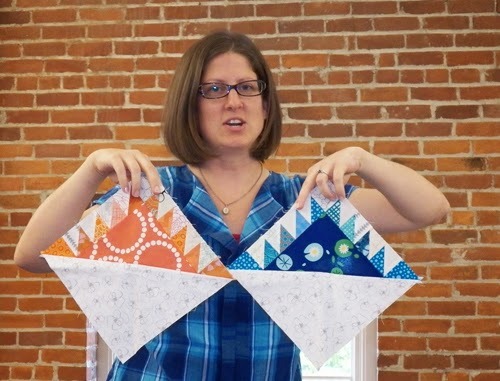 Two Delectable Mountain blocks Jessica made for a quilting bee. Ruth cut the backing for a previous quilt too small, so she made this quilt to go with the mis-cut backing. Amy made this block for Michelle's traveling quilt. Tonight was President Jessica Rider's last meeting before she moves with her family to Nashville. 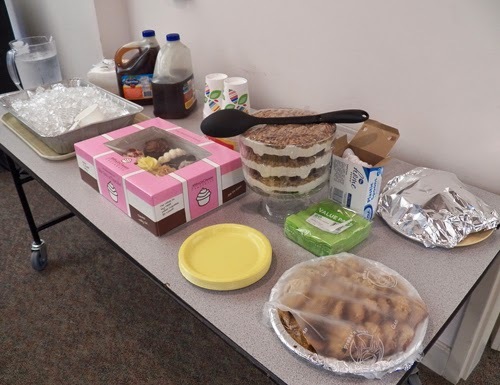 To show their appreciation for all her hard work, several members went all out on snack-time treats. Thanks to all who brought something! The guild also presented Jessica with a gift certificate for a new modern fabric store in Nashville. 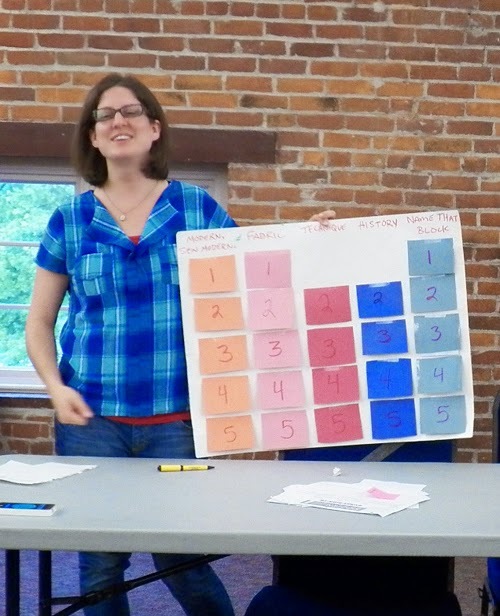 And just to make sure the hole in our collective hearts caused by her absence was extra huge, Jessica created a truly awesome Quilt Trivia game for us to play. She came up with five questions in each of five categories: Modern Sew Modern; Fabric; Technique; History; and Name That Block. Two contestants came up to the table to answer each question and rang in on cell phones with a downloaded game show buzzer app. The person who answered the question correctly earned participation points. 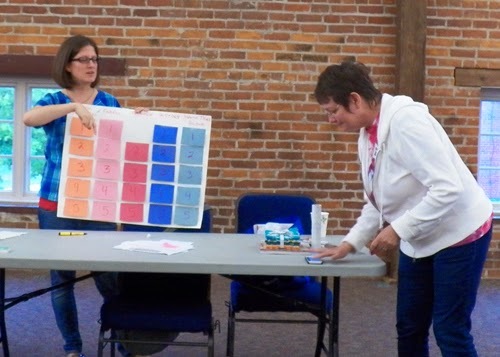 At the end of the fun and lively game, Jessica selected our first participation point winners (participation points are earned by attending sew-ins, bringing snacks to the meetings, and participating in show-and-tell and swaps). Prizes included a fat quarter bundle, a modern sewing book, and a collection of tools and notions. We'll start new with an empty participation point bucket at the July meeting. 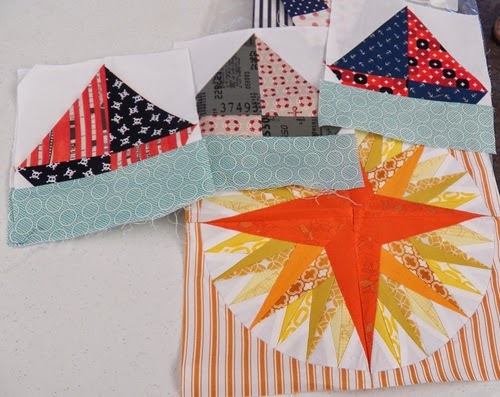 Remember to bring your traveling quilt blocks to show off. And we'll be welcoming Michelle Kirby as our new CMQG president! 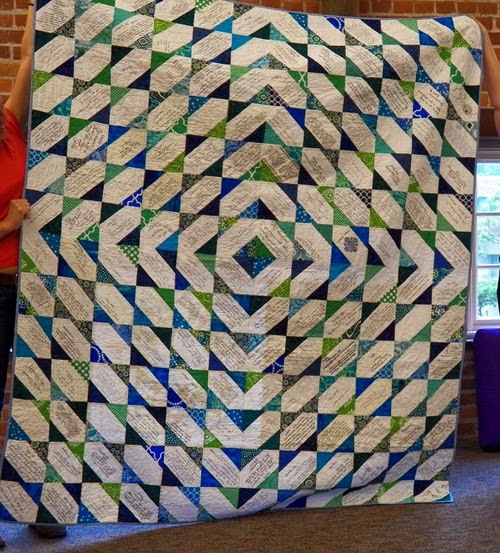 Back in March, the guild started a traveling quilt challenge, and at the May meeting we saw the first round of blocks made in response to the original blocks. Pretty cool stuff. 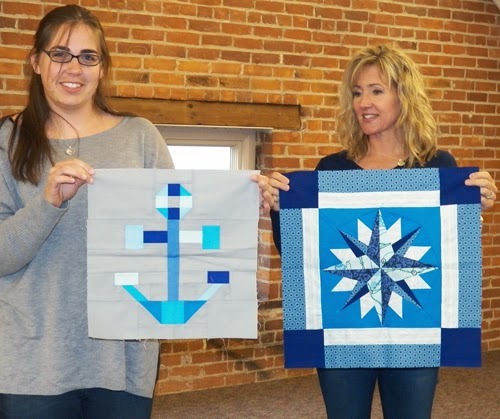 Amanda made an anchor block (left) to go with Christy's nautical block (right). Christy added three more blocks for Janine's traveling quilt. 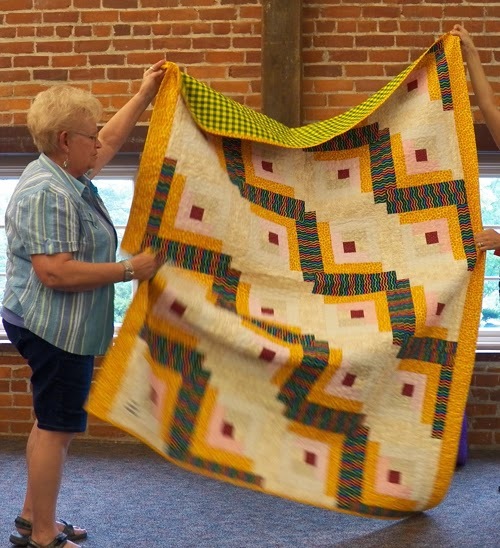 Janine added the improv log cabin section (right) to Kathy's quilt. Kathy made an improv log cabin (center) for Amy's sampler quilt blocks. Jessica added a house and stepping stone section (left) to Kayla's original block (right). 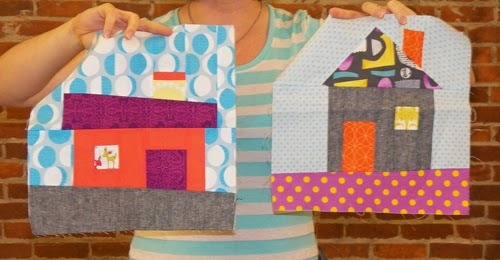 Plus Jessica threw in some house blocks she's made for Sewn Studio. 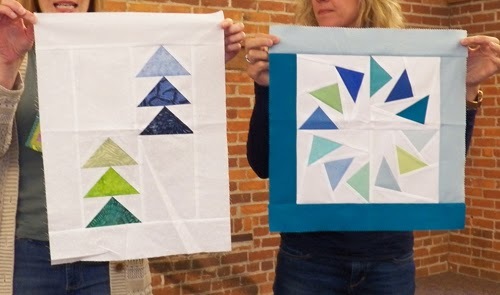 Kayla made a block in the same colors (left) as Carole's original block (right). Carole took Gillian at her word when she said, "Anything goes!" and cut Gillian's block and added strips of solid coordinated colors. Gillian added water to Brooke's boat blocks (that's also Brooke's original nautical star block). 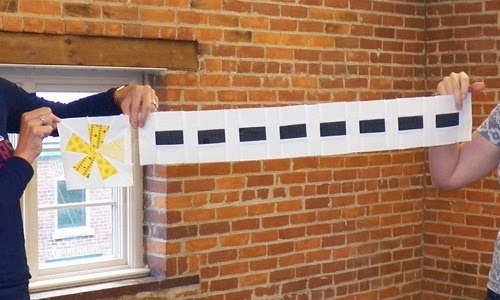 Since Brooke's quilt could take on a pirate theme, Gillian made a B pirate flag. And finally, Gillian made this dashed line and gold star that a person would see on a pirate map. Brooke made this block for Jessica's quilt. It's a block Brooke always wanted to make and now will never have to make again. Christine made a circle of geese block (right) for Kay's quilt (original block on left). 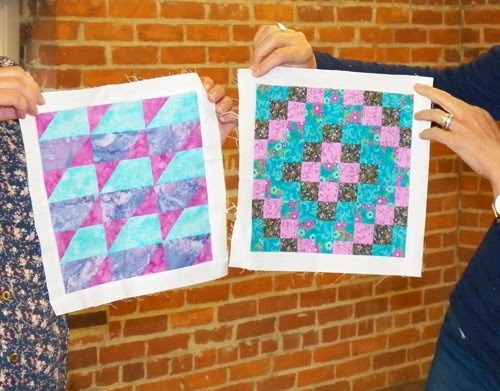 Kay's block (left) used batik fabrics in the colors Kim used in her original block (right). 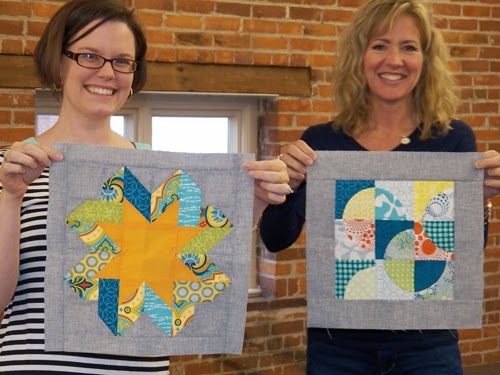 Kim made pinwheels (left) to go with Ellen's original block (right). Ellen made plus blocks to go with Teresa's original block (center right). 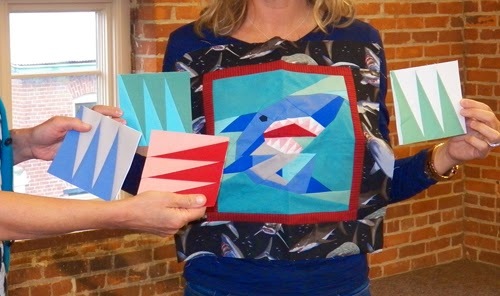 Teresa made shark tooth blocks to go with Christine's original block (center). 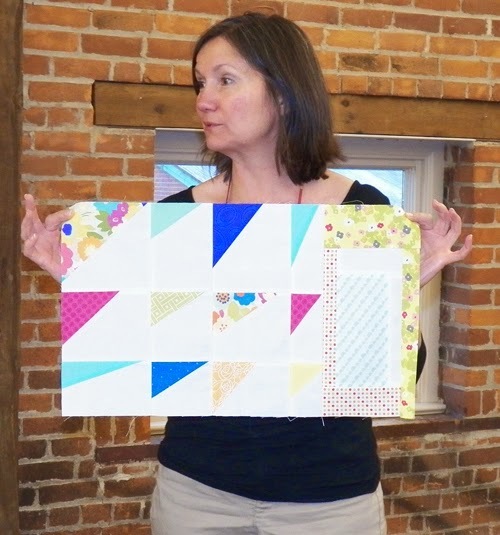 The read the parameters each member set for her quilt, check out this block post from the March meeting.